Q: Last year you told us how eager you were for Carol to get to use a weapon against a walker. Now that she's a veteran, has it been everything you hoped it would be? A: It's everything I hoped for and a lot more. The psychology of it is interesting. My first zombie kill, at the fence, with a crowbar, it was so weird to put one down, that was the first time for me as an actor. It was kind of heart-breaking; I mean you know you have to do it, but always there's this thought in the back of your mind like this is supposed to be somebody. Q: Did you do any training to get in fighting shape for these scenes? A: There wasn't really practice, it was just getting acquainted with the gun, getting used to if there was any kind of kickback or anything. The difficult thing is if you're putting down the walker with any kind of instrument in your hands -- like the crowbar, or a machete -- it has to be so precise, you don't want to actually hurt anybody. The actors who play the walkers often can't see much, but we practice those moves lots of times before we do it. Last season I smacked one of the zombies' hands with a plank of wood, and I was petrified. But she was OK! Q: Everyone talks about how hard the conditions are on set. How has this season stacked up? A: Being in the prison as much as we have been is a relief from the heat, but at the same time, being outside like we were on the farm was nice. I guess I like being miserable; it just plays into what's going on. We're hot, we're miserable and we're sweaty. Q: The chemistry between Carol and Daryl is pretty evident now. How do you and Norman Reedus get along off-camera? A: I love my scenes with Norman. He is such a fun guy to be around and he throws in some great stuff. He's always unpredictable and organic. It really is something that's evolved. We had a great sit down in Season 2, and we were talking about our own lives. He gets me and I get him and I feel like Carol and Daryl are sort of the same way. Q: You spent a couple episodes this season presumed dead. What did you do with your time off from the set? A: I actually like to go to the set and hang out and watch everybody. When you're acting in a scene, you're focused on doing the scene. You can't break character and go, "Oh my God, I love what you're doing"! But these are such great actors and I love to go see them perform. I was there when Rick broke down. They did it many times, and it was so beautiful every time and a little different. I was there when Sarah had the baby and Maggie delivered it and Carl put her down. It's wonderful to watch and makes me proud. It inspires me to see these incredible performances. 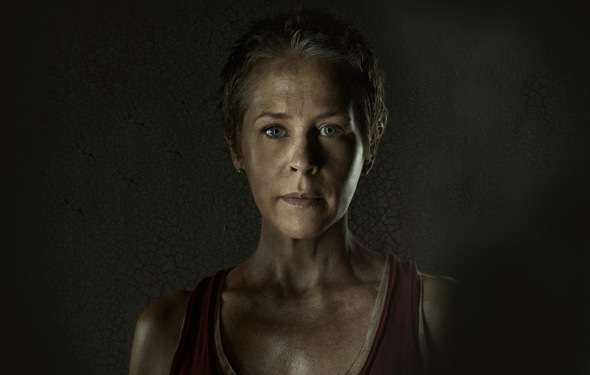 Q: What have been some of your favorite moments for Carol this season? A: I love the scene where Daryl finds Carol, in the cell. It was funny we were joking about making sure that he would be able to pick me up, and I told him that I lost four pounds just so he could pick me up. He was like, "What are you saying?" I was like, "Nothing, Carol is supposed to be dehydrated and tired!" I love Melissa. Great actress great interview, thanks. Enjoyed reading it even tho it was from season three.